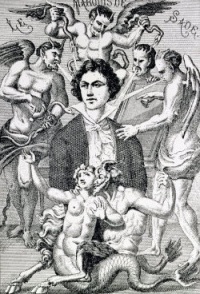 Marquis de Sade (1740 – 1814) and Jean-Jacques Rousseau (1712 – 1778) are often juxtaposed to illustrate the concept of state of nature. Rousseau argues that nature is essentially good, Sade that nature is cruel. Paglia says in Sexual Personae that "Rousseau's mother nature is Christian Madonna, lovingly enfolding her infant son. Sade's mother nature is pagan cannibal, her dragon jaws dripping sperm and spittle." Rousseau contends that man possesses an innate goodness, he is a"noble savage" when in the "state of nature" (the state of all the other animals, and the condition man was in before the creation of civilization and society), and that good people are made unhappy and corrupted by their experiences in society. He viewed society as "artificial" and "corrupt" and that the furthering of society results in the continuing unhappiness of man. Sade's view is diametrically opposed, in Philosophy in the Bedroom, his most philosophical work he holds that "Cruelty, very far from being a vice, is the first sentiment Nature injects in us all. The infant breaks his toy, bites his nurse's breast, strangles his canary long before he is able to reason; cruelty is stamped in animals, in whom, as I think I have said, Nature's laws are more emphatically to be read than in ourselves; cruelty exists amongst savages, so much nearer to Nature than civilized men are." Unless indicated otherwise, the text in this article is either based on Wikipedia article "Sade and Rousseau" or another language Wikipedia page thereof used under the terms of the GNU Free Documentation License; or on original research by Jahsonic and friends. See Art and Popular Culture's copyright notice. This page was last modified 12:24, 4 April 2013.